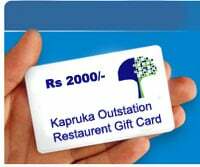 Here is your opportunity to send a restaurant gift voucher in Gampaha area to your home. Kapruka will hand deliver this gift vouchers to your recipient. Gift vouchers expire in 60 days after the delivery date.